Arbor Low is one of the most important prehistoric sites in Derbyshire. Surrounded by unspoiled countryside with fantastic views over classic Derbyshire scenery, it is not hard to image that one is thousands of miles away from the hubbub of modern life. Sometimes referred to as ‘the Stonehenge of the North’, owing to its henge bank and ditch, stone circle and cove, it is a well-known and impressive prehistoric monument. It bears more of a passing resemblance (though on a smaller scale) to that other great Neolithic monument, Avebury, in Wiltshire. 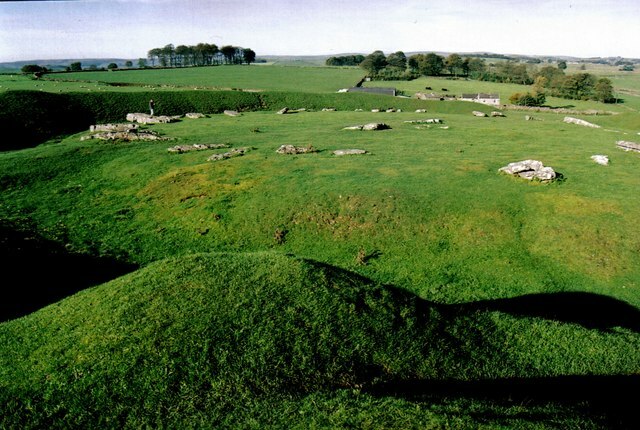 The name Arbor Low appears to derive from ‘Eorthburg Hlaw’, meaning ‘earthwork mound’. It consists of a massive bank and internal ditch surrounding a central area with stone settings. The site consists of a high circular bank, enclosing a partially silted ditch, which in turn encloses a flat plateau. Within this flattened area is a recumbent stone circle of white weathered limestone blocks, resembling the fallen corroded teeth of an ancient titan. In the centre of the circle is a group of four stones, which may be the remains of a cove. This unique arrangement has led some people to describe the circle as resembling a clock face, especially when seen from above. It is not known whether the stones were ever in an upright position, and archaeological evidence has been inconclusive (no socket holes have ever been discovered). Today the bank stands to an average height of 2.1metres (7 feet), and its almost circular crest has a diameter of 79 x 75metres (258 x 246 feet). The substantial quarry ditch defines an oval central area with an approximate diameter of 40 x 52metres (131 x 170 feet). There are two gaps in the ditch and bank that form wide entrances to the north west and south east. Within the central area are the ruined and fallen remains – more than 50 large limestone slabs and fragments – of a large stone circle. When it was built it is likely that there were between 41 and 43 stones in the ring; these would have been set upright, most probably in shallow holes. At the centre of the monument are the remains of a group of stones known as the ‘cove’, which may originally have formed an upright rectangular box about 3–4metres (10–13 feet) wide. To the south west, the henge bank has been disturbed by a large and later round barrow. Abutting the south-south-western bank are a low bank and ditch that run for some distance. The function and date of this linear bank are unknown, but it may be no more than an ancient field boundary built at a much later date than the henge. Nearby Gib Hill is worth mentioning as a site in itself, and takes its name from its use as a hanging hill for a local murderer. The mound is one of the most impressive late Bronze Age barrows in the vicinity, standing at around 16 feet in height even after early destructive excavation. These excavations revealed a stone cist, which contained a small clay urn and burned human bones. This is thought to be a Neolithic oval barrow with an Early Bronze Age round barrow superimposed at one end. This configuration can be seen by walking northwards downhill and looking back at the monument in profile. Excavations of the barrow by the Derbyshire antiquarian Thomas Bateman in the 19th century revealed human remains with a pottery vessel, as well as flint and other stone tools that appeared to be grave goods. On a more mystical theme the site is said to have a plethora of ley lines running through it, but the landscape of the surrounding area is very dense in archaeological sites, which means many alignments are likely to be pure chance. The circle is in a field off a farm track about five miles South West of Bakewell. The farmer who owns right of way to the stone circle may charge a small access fee. Arbor Low and Gib Hill form one of the most impressive complexes of prehistoric monuments in the Peak District. Nevertheless, there have been no excavations on either site for more than 100 years, and our understanding of their date, function and sequence of building is far from complete. By comparing them with better-studied sites elsewhere, however, it is possible that the Neolithic barrow at Gib Hill was the first element, perhaps followed by the bank and ditch of Arbor Low. The barrow over the henge ditch and the round barrow at Gib Hill are undoubtedly later features, as may be the stone circle and cove within the henge monument. It is important to remember that these monuments are the cumulative result of episodes of use that may have continued for more than 1,000 years, perhaps from about 2500 to 1500 BC. All the earthworks are substantial and they would have taken a considerable time to build. Perhaps the co-operative acts of construction were as socially important as the monuments themselves. High on the false crest of a limestone ridge, Arbor Low would have been visible for many miles around – although the view of whatever took place inside it would have been restricted to those standing by the bank.